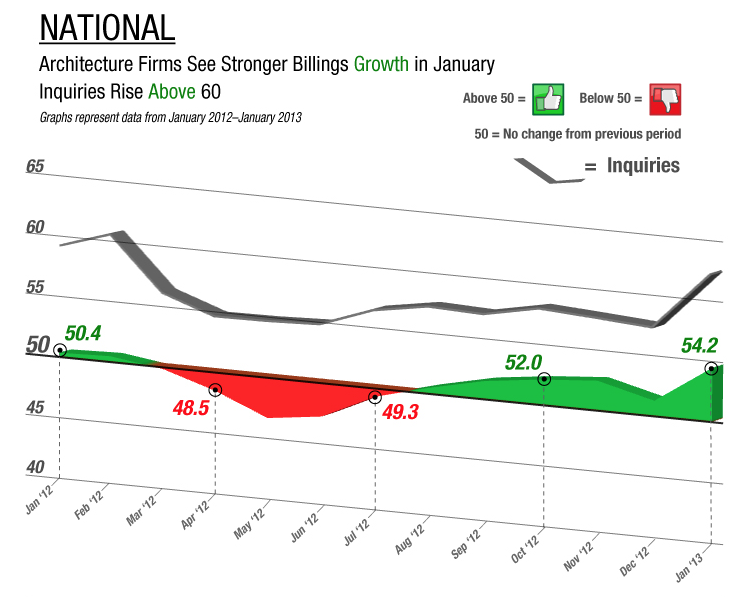 Business conditions continued to strengthen at architecture firms in January, as the AIA’s Architecture Billings Index (ABI) climbed to 54.2, signifying the strongest growth in five and a half years. 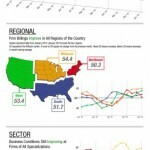 The index’s seasonal adjustment factors were revised in January, leading to some revisions in the historical data, but the overall trend of the last six months remained the same, with firm billings growing every month. 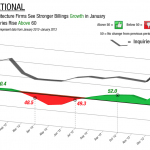 Inquiries into new projects also remained strong in January, and firms reported a strong increase in the value of new design/design-build contracts. 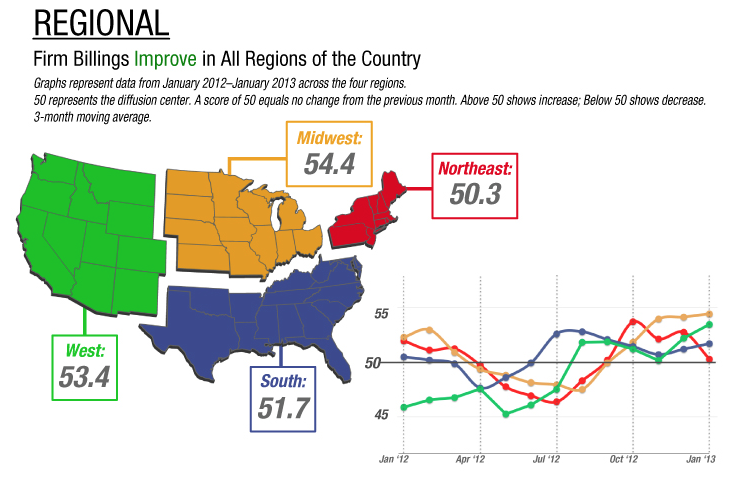 Architecture firm billings continued to grow at firms in all regions of the country in January, with business conditions remaining strongest in the Midwest. 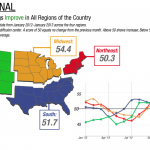 Another impact of the revision of seasonal adjustment factors is that scores for firms located in the West were revised upwards for the last several months, and now show that billings growth there has been occurring consistently since last summer, following several years of severe weakness. 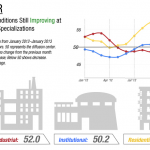 And firms of all specializations reported an increase in firm billings in January, with growth remaining strongest at firms with a residential specialization. Evidence of improving conditions can also be found in the general economy, as nonfarm payroll employment grew once again in January, with 157,000 positions added. A major contributor to this increase was construction hiring, as there have been steady gains in that sector for the last several months. Architecture services employment has also been on the rise recently, reaching 156,000 in December (the most recent data available), its highest level in two and a half years. Along with these payroll gains, the Thomson Reuters/University of Michigan Surveys of Consumer Sentiment reported an increase in consumer confidence in January, a rebound from concerns in late 2012 about the fiscal cliff. However, consumers remain slightly less optimistic than they were a year ago, and the only people currently reporting significant improvements to their personal finances and perceptions of the wider economy are ones with an annual household income above $75,000. This month’s special practice question asked survey panelists if they had seen any recent changes in the length of time required for project design activities. Just over one third (37 percent) indicated that the design phase for a typical project has decreased over the last two years, while just over one quarter (27 percent) reported that it had increased. The remainder said that it had stayed the about the same. 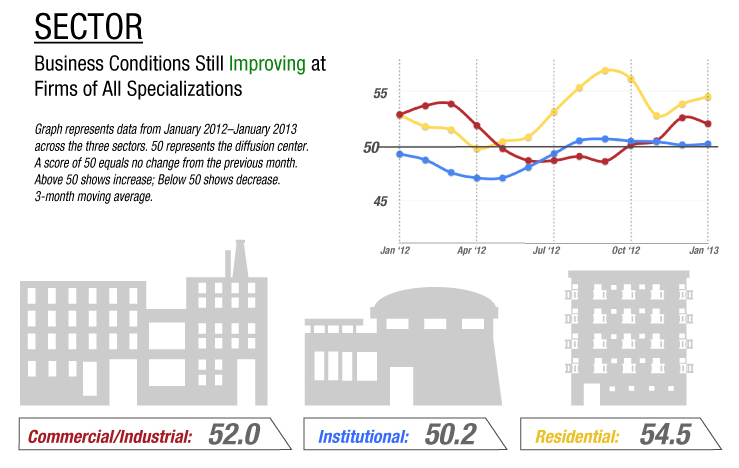 A slightly higher share of firms with a residential specialization indicated that the design phase has increased (31 percent), while 40 percent of firms with an institutional specialization found that it had decreased in the last two years. 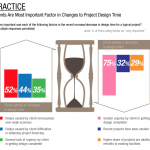 For firms that have experienced a decrease in project design time, the vast majority of architecture firms (75 percent) reported that greater urgency from the client to get the design completed was a very important factor. Firms considered increased project simplicity and the use of BIM to be less important factors in decreasing project design time. 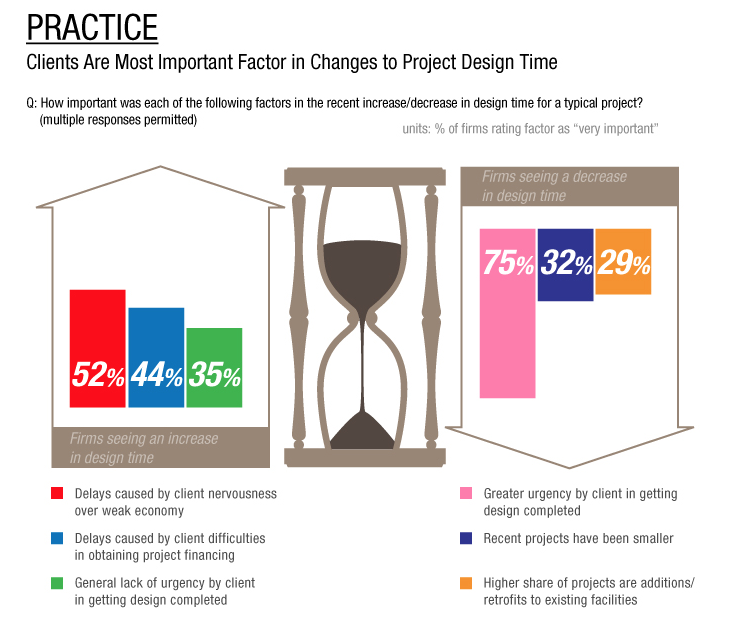 When asked about the importance of factors increasing project design time, 52 percent of respondents rated delays caused by client nervousness over the weak economy as very important, followed by 44 percent who rated delays due to client difficulties in obtaining project financing as very important.